i didn't think i'd be able to, either, but it shows a map and labels the states as you name them, so it's not as hard as it sounds. 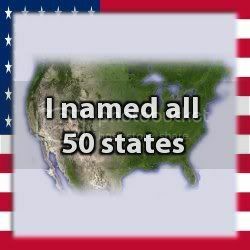 I wish I that good to remember all the states. it's much easier with the map to remind you and show you which ones aren't named yet... though it's hard to see the unlabeled ones when they're those stupid small new england states like rhode island.